… and suddenly it's October. Bella is out of the water for the winter and I am back on the road. My main job now is saving boat money for next summer. Perhaps I can get caught up on my writing as well. August was a month of reunions. My brother, Tim, and his family were visiting the States from Switzerland. Tim's and my schedules lined up so that we could go sailing. I hope to get the rest of the family out when they return next year. Part of the old family crew [see below] was back together and we had a great day of sailing. Even Bella was enjoying herself in a brisk breeze and plenty of sunshine. I think that was the day I lost a hat. A few days later, my crew from the lake crossing came out for another sail. Dave and I had a nice sail and we took Bella out on the big lake. It was the first time that I had her on Lake Michigan since Dave and I crossed from Milwaukee, so it was a double reunion of sorts. Bella was back in her element out on the big lake and the wind was just right on our return; opposite what it had been in June. We took up the challenge to sail all the way up the channel into Muskegon Lake without using the engine. Bella crept along, wind at her back, as other sailboats under power and all the powerboats were passing us. We had to wiggle past the sheriff and a boat they had stopped halfway down the channel. As we ghosted by the USS Silversides Museum, I said I thought we were going to make it all the way. Bella gracefully took us all the way. It was quite a victory over having to get a tow last time. 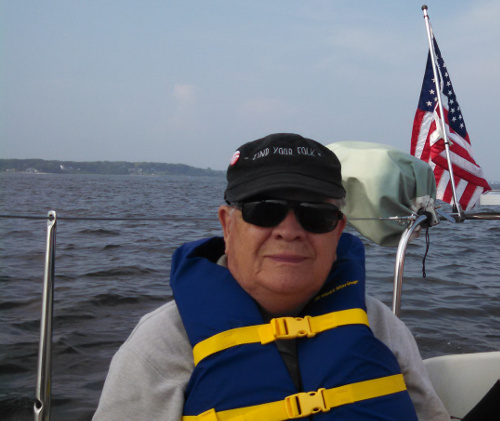 As much as I enjoyed sailing with Tim and Dave, the important reunion was the privilege of sailing again with my Dad. Somewhere around 1976, Mom and Dad bought the family a sailboat. 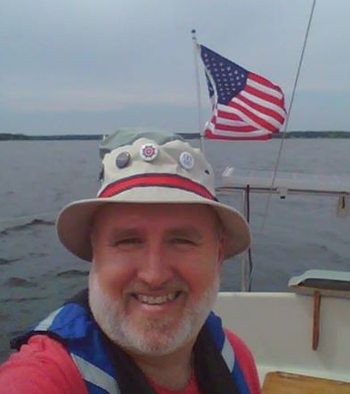 I had come back from scout camp with a Small Boat Sailing Merit Badge. During his Navy days, Dad did a Far East tour in the western Pacific on the USS Bennington (CV-20), an 872 foot Essex Class Aircraft Carrier. While he was aboard, the Bennington was sent to Sydney to help the Aussies celebrate ANZAC Day. He later helped build the USS Enterprise (CVN-65); 1123 feet long! We thought we were qualified to sail a 15 foot Chrysler Mutineer. 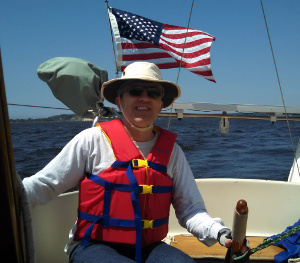 My sailing experience started with a Sunfish on Arrowhead Lake at camp. 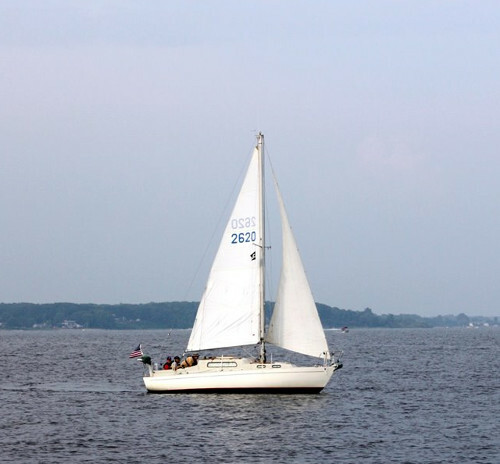 The Sunfish has a single lateen sail and is a good basic sailboat. Our Mutineer, a sloop we named the Luff Boat, had a furling jib forward of the mainsail. Sailing a sloop seemed more like proper sailing. Dad was my first captain. Our crewing was proper and salty but not really formal. We were all learning and we talked about the wind, the points of sail and navigation on the many Michigan lakes where we sailed. Dad let us try our hand at the tiller. It was with Tim and Dad that my love of sail began. With them, I began to get a 'wind sense' and some skill as a sailor; many of the most important moments of my life. It was with Tim and Dad when I first got addicted to the sensation of a sailboat shouldering into the waves. With them, I first learned the quiet joy of gurgling along barely making way and felt the exhilaration when heeled over tearing across the water. I can still feel those delicioius moments hiked out over the windward rail with the boat heeling so much I could see the centerboard ghosting under the water over my shoulder. Later, Dad was confident enough in my seamanship that I was allowed to take the boat out myself. Often towing her behind the family Chevette to go sailing with a buddy or a girlfriend. It was during these days that I discovered the true love of my life – sailing. These last eight years specifically, but really my whole life has been trying to get back to sailing. I had a few boats when I lived in Florida and even lived on one for a while. I've been working hard to get to the point that I can sail off for a while on an extended cruise. Turns out its a lot of work to set yourself up to be a boat bum. Back to this August, my cousin Sherry and her son Ben came out from New Jersey to see Grandma Curtis. While they were here I was going to take them for a ride. The dock where I kept Bella is not quite stable. I had been looking around for a dock or a pier that was more solid. Dad has some balance issues these days and I wanted him to be comfortable enough to come out and go for a sail. 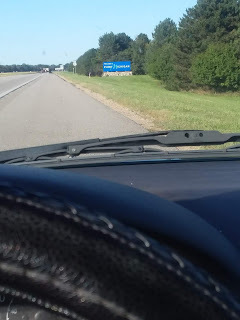 I hadn't found it yet, when two cars worth of family showed up to watch me take Sherry and Ben out. Dad came walking right out on the dock to greet me. I was elated! When Sherry decided to stay on shore and take pictures, I asked if anyone else wanted to come along with Ben and I. Dad stepped right up! It was fun to have Ben aboard and talk to him about sailing. He and his dad have a Sunfish they rescued and are sailing in Jersey. No offense to Ben, but to have my Dad, my original captain and sailing mentor aboard was incredibly important to me. It was an auspicious day! The wind was such that we ended up sailing up the lake toward the city. We didn't make it easy for Sherry, the photographer, to get any good shots until we were coming back. Next year is going to be a big year for Bella and I. These special moments will be along with us as we sail south. Really nice blog - Everyone will enjoy it and especially one person! Thanks for the thoughts. We learned to love sailing together. Now I'm just with you in spirit. I know Tim had a great time and the kids and I are looking forward to next summer!